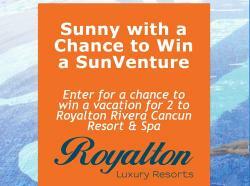 Prize: all inclusive vacations for two (2) at Royalton Riviera Cancun Resort and Spa, Riviera Cancun Mexico, onboard Sunwing Airlines - airfare/7N hotel-Approximate taxes is $400 per person – to be paid by Sunwing Travel Group. Statistics: This contest was opened by 338 and entered by 90 ContestChest.com members. 27% of those who opened the contest, entered it.